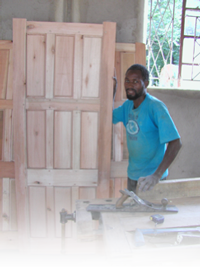 Pictured Above: Doors made in the vocational shop at Newstart. The Newstart Children’s Home is designed to take children from 5 to 18 years of age who have lost both parents and who have no one willing or able to care for them. Children are provided with food, clothing, uniforms and tuition for school and a caring and safe environment, a chance to learn life skills and moral values. The orphanage is designed to house 50 children. The boys wing and the girls wing are joined by the kitchen and living room. The children attend the Simbarandenga Primary School whose property adjoins the Newstart Children’s Home. A Secondary School built on the grounds has recently been accredited for older children wishing to continue their education. Twenty students are currently enrolled in classes. A vocational has been started for older children that will enable them to be taught a vocation, such as sewing, carpentry, hairdressing, welding, building, pluming. Every Day 300 Orphans from the primary school, next door, are given lunch from “Libby’s Soup Kitchen”, located on the Newstart grounds. These are AIDS orphans who are living with relatives or friends but who do not get enough to eat and were often fainting in school. No medical care is available to the poor in our area and we hope to be able to alleviate much of the pain and suffering in the local villages. The clinic has three treatment rooms for treating the many tropical diseases common to the area. Our laboratory is also equipped to offer HIV testing – and we hope to able to offer some treatment for HIV in the near future. Our Baby Center for HIV and abandoned babies is designed to help in a small way the desperate mothers who are infected, sick and unable to care for themselves or their infants. The nursery will accept children from birth to age five and is scheduled to open early in 2007. © 2007 New Start Childrens Home. Site designed by LMW Design, Inc.